Last week was pretty much the inverse of the prior week with several new positions being added on, but relatively few option positions were taken off as profits. However, there were still 11 different positions taken off this past week that produced over $450 of investment income. I've had pretty good success using the gold miner ETFs as trading/income generating vehicles over the past 6 months or so. Much of that is due to gold being relatively range bound as well as the fact that the implied volatility is quite high on gold related investment products. That's good for option sellers because high implied volatility means higher option prices. This put option generated net profits of $52.96. Based on the $2,100 of capital securing the contract that's a 2.52% return on capital. The annualized return works out to 40.1%. 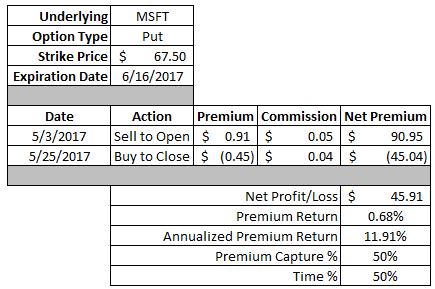 I was able to capture 85% of the max potential profit in 53% of the days until expiration. The good thing about selling call options against shares that you own is that if the option isn't in the money then you keep the option premium and can reduce the cost basis on the shares you own. That's a win in my book. This covered call produced net profits of $23.91. Based on the $34 strike of the call option that's a decent 0.70% return. The equivalent annualized return is 13.7%. I was able to capture 92% of the credit received in 47% of the days until expiration. Altria is a company that I really want to add to my portfolio; however, just at these valuations. That seems to be the case with many of the popular dividend growth companies. This put option provided net profits of $44.91. Since there was $7,000 of capital at risk on this trade that works out to a 0.64% return. The equivalent annualized return was a solid 21.5%. I was able to capture 67% of the maximum profit potential in 43% of the days until expiration. 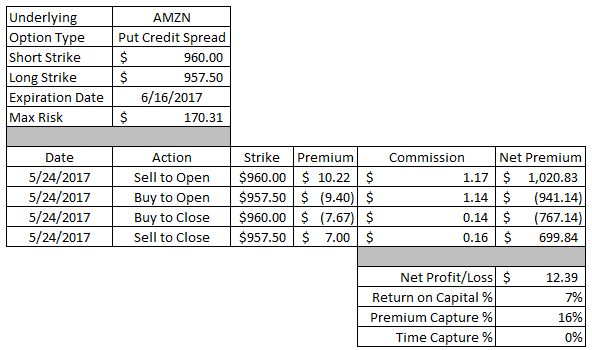 For those that remember from the post earlier this week I currently have on another put credit spread in Amazon. Normally it takes a bit longer to take positions off at a profit, but if I can get a 7% return on capital in less than one day I'll take that every time the opportunity presents itself. This spread generated net profits of $12.39 in the span of just a few hours. With $170.31 in capital at risk on this trade that's a solid 7% return on capital over just a few hours. 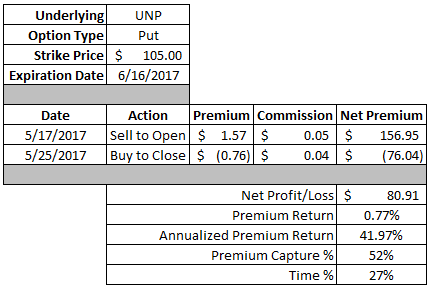 I was able to capture 16% of the maximum potential profit in less than 1% of the days until expiration. This covered call was originally part of a covered strangle where I was essentially wanting CVS' share price to stay within a certain range. Unfortunately, that wasn't the case as the share price declined below the strike of the put side of the covered strangle. Although the good thing is that it allowed me to take off the call side of the covered strangle and lock in some solid profits. The covered call portion of the covered strangle generated net profits of $70.91. 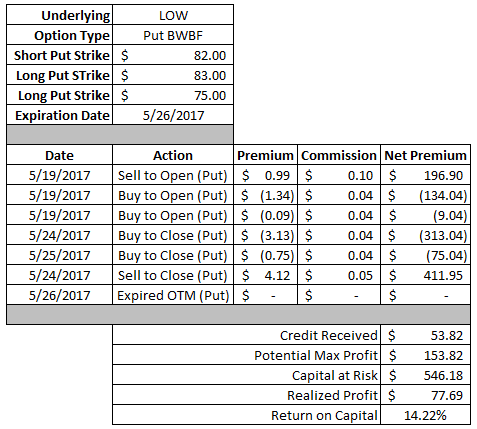 Based on the $82 strike of the call option that's a 0.86% return which works out to a solid 17.0% annualized return. I was able to capture 93% of the option premium in 54% of the days until expiration. I like the ability to use options around your positions in order to bring in option premium that can be used to reduce your cost basis. This works especially well in a tax sheltered account such as an IRA. Thus far I've been able to reduce the cost basis on my CVS shares from $83.20 down to $76.60 through collected option premium. That's around a $6.60 per share improvement to my cost basis. Technology companies have been leading the markets higher over the last month or so and Microsoft has been one of the participants. After announcing earnings in late April the implied volatility remained elevated which meant richer option premiums and more potential for profits. This put option produced net profits of $45.91. Since there was $6,750 of capital securing the position that's a 0.68% return on capital. The equivalent annualized return is a solid 11.9%. I was able to capture 50% of the maximum profit in 50% of the days until expiration. Micron continues have high implied volatility which leads to high option prices. While I'm not keen on starting a long term position in this company I don't have a problem using it as a way to generate income via options. This put option provided net profits of $32.91. That's a 1.18% return on the $2,800 of capital securing the contract. The annualized return on this works out to 32.9%. I was able to capture 51% of the maximum profit in 41% of the days until expiration. As I've progressed in my foray into options trading one of the most important takeaways is just how useful a two sided market can be. Whenever the markets are up and down then up and down that gives the options trader the opportunity to put trades on when volatility is expanding and then take them off when volatility contracts. This put option produced net profits of $80.91. With $10,500 of capital securing the contract that comes to a 0.77% return in just over a week's time. That works out to a 42.0% annualized return. I was able to capture 52% of the maximum profit on this position in just 27% of the days until expiration. 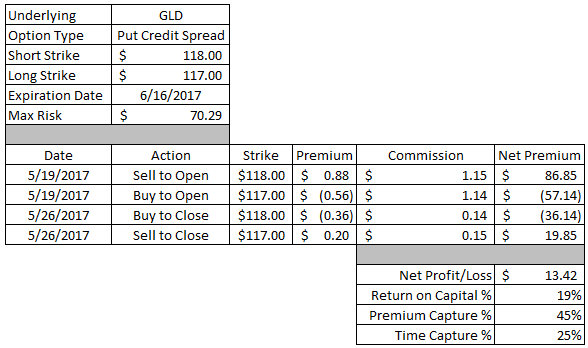 This trade worked out great with gold's rise towards the end of last week. The move higher meant that the $118 short strike moved further out of the money which led to a decline in its price. This spread generated net profits of $13.42. With $70.29 of capital at risk on this trade that's a hefty 19% return on capital. 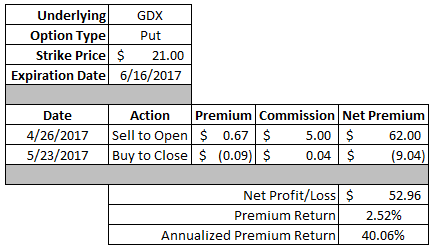 I was able to capture 45% of the maximum potential profit for this position in just 25% of the days until expiration. This position was technically a broken wing butterfly; however, I was planning on treating it like a put ratio spread. The wider wing on the downside was used just because ratio spreads aren't allowed in IRA accounts at my brokerage firm even though you can set up the exact same position by using multiple trades. Although by using the put broken wing butterfly it makes things simpler since you can open and close the position in one trade each way if need be. Market participants apparently didn't like Lowe's earnings release and the shares sold off pretty strongly. So I closed the put debit spread the day that earnings were released for essentially the max profit and then left the larger put credit spread open in case the share price rebounded later in the week. Fortunately for me that's exactly what happened and I was able to close the position out for a solid gain although not at max profit. This position produced net profits of $77.69. As a wide broken wing butterfly there was $546.18 of capital at risk on this position so that works out to a 14.2% return on capital in just a few days. I have to say I was a bit surprised to see this put option get executed primarily because there was still about 2 weeks left until expiration. Although with share price of Pfizer being well below the strike price there wasn't a whole lot of extrinsic value left in the option. Through this put option I had to purchase 100 shares of Pfizer at an adjusted cost basis of $33.20 per share. Based on the current annual dividend of $1.28 per share this lot of Pfizer has a YOC of 3.86%. 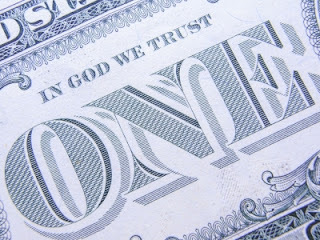 This brings my position in Pfizer within my Rollover IRA up to 200 shares at an average cost basis of $33.24 per share. I will look for opportunities to sell call options against these shares in order to continue to take in premium; however, I don't want to add a 3rd lot of shares so any option positions will not take on the risk of adding more shares. If everything goes well this week then May will end up being my most profitable month of options trading to date. April set a personal best with $2,071.79 in options profits and thus far in May I've surpassed that at $2,155.61. Year to date my option profits are at $8,294.15. Well done! Selling options for income enabled me to retire at 40. It is a powerful and low risk strategy. According to me, May is most profitable month. My preferred method of generating income from my investments. It is just plain of the old dividend growth investing.It is the good method of generating income.